Toni Preckwinkle, Cook County board president, speaks at a Wednesday breakfast. Preckwinkle and several other city officials discussed progress on county-wide goals as well as transportation. Cook County officials detailed the current state of various county-wide programs to Evanston community leaders and offered suggestions for the expansion of local partnerships at a Wednesday breakfast. 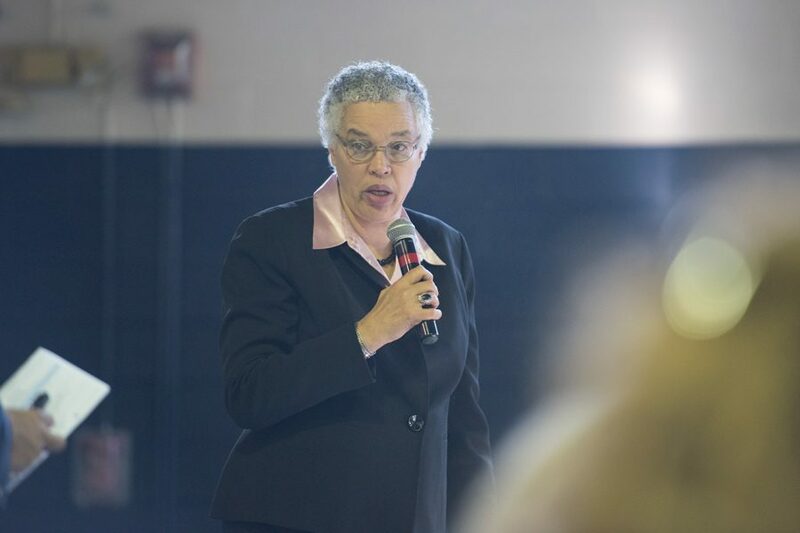 Toni Preckwinkle, Cook County Board president, spearheaded the Evanston Community Leadership Prayer Breakfast, which featured presentations from various county departments about recent progress made on goals. The breakfast, held at the Faith Temple Church of God in Christ, 1932 Dewey Ave., was attended by about 100 residents and multiple local leaders, including Mayor Steve Hagerty and former Mayor Elizabeth Tisdahl, both school district superintendents and Alds. Robin Rue Simmons (5th), Peter Braithwaite (2nd) and Cicely Fleming (9th). Preckwinkle said when she first assumed her role, no one held themselves accountable and officials did not have metrics to identify progress, but she thought that had changed in recent years. “What we try to do (now) is ask every department, bureau (and) elected official: What are you trying to do and how are you measuring your progress?” she said. Representatives from eight departments and community services reported on their respective progress at the event. John Yonan, the Cook County superintendent of the Department of Transportation and Highways, said transportation is the key to improving residents’ quality of life and economic development opportunities. Yonan said he met with Hagerty, Cook County commissioner Larry Suffredin and Chicago Transit Authority president Dorval R. Carter Jr. to talk about ways they could rebuild CTA stations in Evanston and make them more accessible and modernized. He said the county’s “number one” policy priority is to make investments in transit. Ray Bentley, chief community officer at the Chicago Cook Workforce Partnership — a collaboration between Chicago and Cook County to more effectively distribute resources — said between 100,000 and 140,000 people visit job centers throughout the Chicago area during the year, including one at Evanston Public Library. He said job seekers are able to use the locations “like a home office,” with access to computers, workshops about interviewing and resumes as well as free audio-visual aids. The organization targets many populations, including adults and youth in low-income communities, dislocated workers and people with disabilities, Bentley said. Former Ald. Delores Holmes (5th), who helped organize the event, told The Daily the presentations gave community members insight into the best ways the county can provide Evanston with more resources.